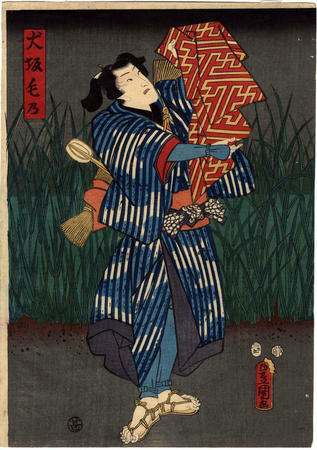 "[The] literary source for this print was the best- selling novel Nansō Satomi hakkenden (The Legend of the Eight Dog Warriors of the Satomi Clan in Awa Province), by Kyokutei Bakin (1767–1848). This ninety- eight-volume epic, which took Bakin nearly thirty years to complete, was published in serial format between 1814 and 1842. Set in the mid-16th century, Hakkenden was the saga of eight young warriors born under the influence of the dog god, Yatsubusa. The eight were spiritually related and thus destined to find each other. Once united, they would help the warlord Satomi rise to power in Awa Province (modern-day Chiba Prefecture)." This information is taken from the Minneapolis Institute of Arts web site. There are two prints in the Lyon Collecton devoted to Inuzaka Keno, one of the 8 Dog Heroes. See also Shigeharu print #719.